^^Look for the significant volume at the chart. Tingin ko lang marami dyan di nag exit. More of they are accumulating it. The run-up on merged moving average on your chart is probably the one who exited and was absorbed by other players. Baka may alam na sila dati pa. I recall that one po... Actually started yan (march) ni BP then yung sell down na sinalo nila Astra Sec, and other non-tsupitero brokers but they dont sell eversince. Then nung april na volume, insignificant sya kasi BP moves then pero ang major seller that time is abacus, buyer is tower (pasahan? dont know). Yung May na volume is parang cross sale (sila lang halos ang trade). 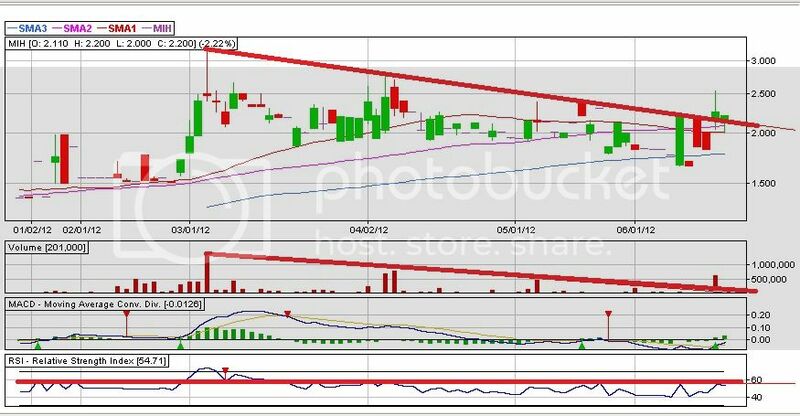 Buy yan ni SunSec, ang seller is COL/PanAsia. Then lastly nung thursday... Started accumulation by PCCI. 27,986,654 which represents 6.79% of the total outstanding shares." Thanks for the info Maam Ruach and bossing sbee. Napaisip lang ako, 6.79% lang ng shares sa market yung i-b-buy back nila, so ibig sabihin posibleng hindi magkaroon ng tender offer para sa lahat (which will not be lower than the current book value)? Will also monitor this one. (06-24-2012, 12:28 AM)GAP Wrote: Thanks for the info Maam Ruach and bossing sbee. Napaisip lang ako, 6.79% lang ng shares sa market yung i-b-buy back nila, so ibig sabihin posibleng hindi magkaroon ng tender offer para sa lahat (which will not be lower than the current book value)? Boss Gap, 6.79% lang yung float. So lahat mabibigyan ng tender. And if you look at the top100 stockholders, 11M lang yung PCD nominees, which means less than 3% lang ang nakakalat sa mga traders. The only question here is WHO will initiate the move? The insiders here should learn from PWR (0.30+/- to 5.60 to 1.40) and AAI (4.00+/- to 101 to 8.50) moves, or worst the IP (1.40+/- to 3.60 to 1.10) and Cloud (2.6+/- to 4.5 to 1.5?) moves. Thanks for the clarification boss.